Leonard Diggs has been farm manager at Shone Farm for 20 years. On 365 acres off River Road, the working farm is the outdoor learning laboratory for Santa Rosa Junior College’s agriculture and natural resource programs. As the manager, Diggs keeps track of all of the farming enterprises and coordinates the staff, students, and instructors who use the farm as a lab. 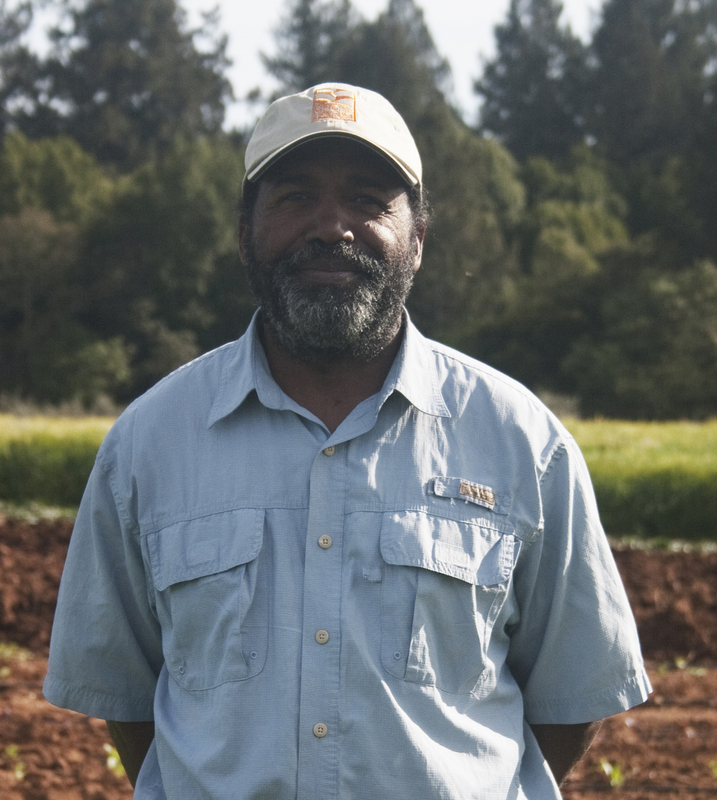 In March, Diggs was honored by CAFF/The Farmers Guild as Legacy Farmer of the Year for his contributions to local agriculture. We spoke with Diggs about his journey to farming, how to encourage young people to pursue a career in agriculture, and what he considers his legacy to be. I grew up in Woodland in Yolo County. My family is not agricultural, by any means, but they’ve been in Woodland since 1850. I started working in various ag jobs when I was 13. I worked in a tomato field, at a fertilizer company, and as a driver hauling tomatoes, wheat, and Christmas trees. I realized that I liked working outside so that’s what led me down the path. I majored in ag science management at UC Davis. After I graduated, I managed a demonstration farm in Sacramento. From there, I was recruited by Richard and Saralee Kunde to start an organic farm in Sonoma County. In 1991, we started growing crops on 20 acres on River Road. We sold organic vegetables throughout the Bay Area. At the same time, I was teaching classes on speciality crops and organic vegetables at SRJC. When the Shone Farm manager decided to retire, I applied for the job. The average age of U.S. farmers is 61. How can we encourage young people and others to take on farming as a career? I’ve thought about that a lot, especially after being honored as a legacy farmer. I was turned onto organic farming when I was in college because that’s what really resonated with my spirit; I thought I was doing the right thing for the land. I was fortunate; many of my peers were also interested in agriculture. That was also a time when families that had been farming for a long time were questioning its value. One of my best friends in Woodland came from a farm family and his parents encouraged him to get a good education and find a non-ag job. We both graduated from UC Davis in the same time period; he got a job as an engineer and made quite a bit more money than I made as a farmer. Young people can do the math. We aren’t encouraging them to go into agriculture because the choices are pretty stark. You make less money, you put in a ton of time, and the longevity or impact you might have is not clear. What we do at SRJC is a gateway for young people who will go into agriculture, and others who will work in some part of the food system. We also see a different group that is transitioning from other careers—and yet they don’t have baseline [farming] knowledge. Many of them would like to go straight to go and skip some of the investment they need to understand the nuances of plant physiology, what it takes to maintain soil, and irrigation techniques: All of the pieces of the puzzle that are part of being a farmer. I see that there’s not necessarily the willingness to make that investment. People are excited about the idea of it, but haven’t learned some of those principles, so they go out and reinvent the wheel. I see people being very excited about regenerative agriculture and carbon sequestration and they want to get involved. But they need to develop other skill sets in order to be successful. It can be challenging for them to take the time to get to that place. Mature individuals who are coming to farming as a second career may spend five years getting farming under their belt. And then, they’ll say, “Wow, I’m ready to be done with this. I’m working pretty hard.” On the flip side, if they’re young and they’ve spent that five years, and they’re struggling financially, they may be ready to be done with it. They might be at the stage of their lives where they want to develop a family and save some money; they realize that this is a very difficult pathway to do that. Over the last few years, I have noticed more young people excited about farming, similar to what I saw in the ‘70s. I do see a dilemma in that many of them are excited about the bio-intensive scale at Singing Frog Farms. If that model is going to continue at the level we need for our community, we have to encourage more farmers to get involved. To produce as much food as our current, large-scale farming systems, it would take hundreds of bio-intensive farmers in every community. Part of what I see among young people is that their interest in farming is very personal—it’s not necessarily focused on the community. They mainly want the experience and to sell small amounts locally. I’m not sure how many of those farmers will scale up so they are producing not only for themselves, their families, and maybe their neighbors, but are also producing bio-regionally for their communities on a larger scale. Ultimately, that’s what we need to do. Otherwise, what are the options? Are we going to buy-in our food? Or are we going to have this group that’s been doing it on a large-scale continue to do what they’re doing? How does it feel to receive the Legacy Farmer award? In college, I was very impacted by hearing Frances Moore Lappe speak. She said, “If you have a dream or vision that you can complete in your lifetime, it’s not big enough.” I feel compelled to create sustainable systems for educating the next generation of farmers and getting them exposed to things that are useful: Hands-on learning, basic scientific principles, and practical mentoring. It’s been said over and over: farmers have 40 different opportunities to make a difference. That’s a 40-year cycle. Forty is not a big number. It’s going to be really important for farmers and farm educators in our community to figure out ways for that knowledge not be terminal. I see that happen with a lot of small farmers. If they don’t have family members to pass the farm to, or don’t have young farmers show up at their door, everything they’ve built and all of the knowledge they’ve gained goes away. Communities and small farmers need to gather to explore: “What can we do to further this avocation?” and “How can we keep this knowledge relevant to every generation?” My legacy is that I’ve kept focused on that. My back is the brick for the next generation to build on. I want the effort I’ve made, whether I’m remembered or not, to make a difference for the next generation. Leonard is so generous with his wisdom and caring. He is a treasure to our community and to SRJC students, faculty and staff.